Usb telbox, an external device with an USB interface to computer, will get you to have internet phone calls by cordless phone or even a fixed telephone. 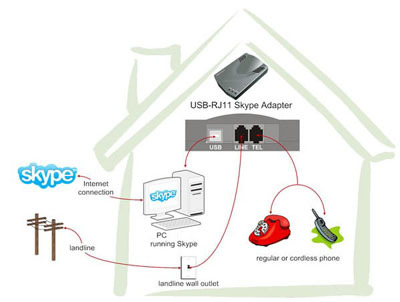 When making or receiving calls from skype, you can recognize the identity of callers by different rings. As to home users, especially for whose relatives are on abroad, it is of significance. You will escape from missing in heart instead of suffering from overhead expenses and time limits of international calls. The cheap device and low communication expense will make you have a good time on phone calls to your heart's content. As to enterprises users, this kind of usb phone adapter will also benefit you a lot with many additional functions in it. Except for saving money, there’re some other factors including no longer keeping around the computer to receive calls, switching from skype communications to mobile phone and switching in reverse, etc. The installing operations of usb telbox are also simple. The picture as below has shown it clearly. As a switch device, it is used to connect all required equipments like computer, telephone and landline outlet. After connecting with cables, set IP address properly. You’ll be surprised to find that it functions as a router and all kinds of phones are available. Furthermore, you can establish your own internal LAN network by connecting PC computer, laptop and internet phone to a certain interface. Nowadays, usb telbox is available in usb phone world. For those who don’t want to replace the fixed telephone to an usb phone, it will also hit the mark. It is said that even a fax machine can be used on it. It is believed that the differences between Internet and telephone network will be eliminated one day.